Nearly 100,000 people in Flint, Michigan have not had access to clean water from their faucets for two years, and it's been more than six months since a public health emergency was declared in the city. Residents are still drinking, cooking and bathing with bottled water and many are afraid to drink water from their sinks even with filters. Many families are concerned that their children have suffered permanent damage to their brains and nervous systems after drinking the lead-tainted water. Officials are also investigating whether the water is linked to Legionnaires' disease, which resulted in the deaths of a dozen people in the area. On Wednesday, for the the first time since the water crisis began in April 2014, President Obama visited the city, located 68 miles northwest of Detroit, where federal officials briefed him on the city's efforts to recover, he met with residents and he drank filtered Flint water. "Filtered water is safe, and it works," Mr. Obama said at his briefing as he sought to reassure residents that the water was safe to drink as long as filters are used and that their children would wind up being "fine" in the long-term. Flint's water became contaminated with lead after an emergency manager switched the city's drinking source from Lake Huron to the Flint River two years ago. Michigan's Department of Environmental Quality failed to require the city to add corrosion-control chemicals and as a result, lead leached from the pipes into the water. The city reconnected to water from Detroit last October, but the damage had already been done. Three state and city government workers were recently charged with official misconduct, evidence-tampering and other offenses. Michigan Gov. Rick Snyder, a Republican, requested federal assistance in a letter to Mr. Obama in January in which he estimated the cost of replacing Flint's water supply infrastructure at more than $767 million, which the president said Wednesday could take years to complete. He signed an emergency declaration that has been extended to mid-August, which has allowed the federal government to distribute more than 9 million liters of water, more than 240,000 water filter replacement cartridges and 50,000 water and pitcher filters. Since the state declared its own emergency declaration, it has committed more than $67 million, and Snyder has proposed a total of $230 million in state funds to help Flint. 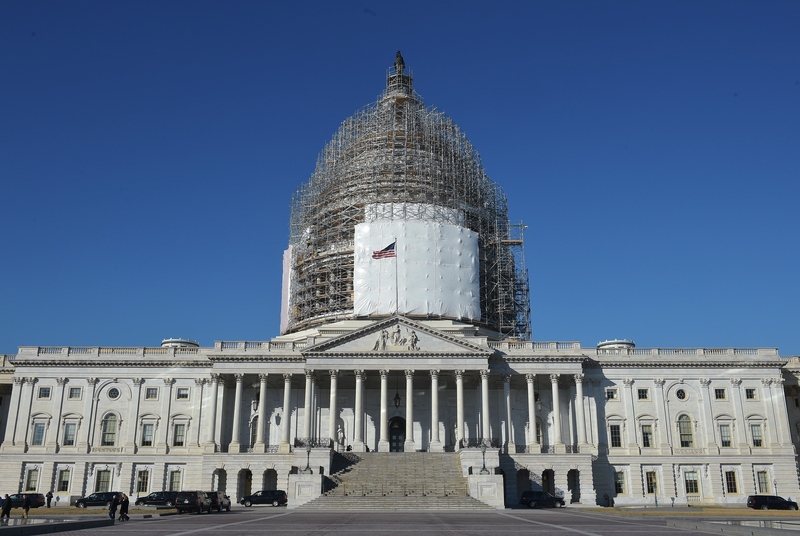 Back in Washington, Congress hasn't passed an aid package yet. "This is an emergency," Rep. Dan Kildee, D-Michigan, told CBS News by phone before he boarded Air Force One to travel with Mr. Obama to Flint on Wednesday morning. "If somebody's house is on fire, you don't call a city council meeting to have a series of hearings on how the fire started and then have a budget deliberation to see whether or not it's in the interest of the community to purchase the water and gasoline and hire the firefighters to put out the fire. You put out the fire." Kildee represents Flint in Congress where Republican leaders have barely addressed the crisis. In February, the House overwhelmingly passed a bill the Michigan lawmaker introduced that would require the EPA to notify the public about extremely high levels of lead if local or state authorities take no action. He's also personally spoken to Speaker Paul Ryan, R-Wisconsin, on the House floor about his constituents. "He basically has said that whatever we do has to go through 'regular order,'" Kildee said. "That's a little frustrating to me because emergencies don't happen in regular order. They don't happen on a schedule." Asked if the speaker plans to bring any Flint-related legislation to the House floor soon, an aide to Ryan referred CBS to the House Energy and Commerce Committee for information about any action already taken or being considered. Kildee has sponsored other Flint legislation, including a $765 million comprehensive aid package he introduced in February that would provide funding to replace lead pipes in Flint, expand access to health, early childhood education, after-school and other programs, provide economic assistance and create a Center of Excellence on Lead Exposure that would monitor long-term health effects. No Republicans have backed the legislation. If anything, a $220 million aid package in the Senate might have a chance of passing. The proposal, sponsored by Michigan's Democratic Sens. Gary Peters and Debbie Stabenow, was recently added by several GOP senators to a $9 billion water development authorization bill. That bill made it out of committee last week 19-1 and is now ready to be considered by the full Senate. It would provide an immediate $100 million that Flint could access for infrastructure aid after submitting a plan to the EPA. It would also invest millions in a national registry to track health effects of children exposed to lead, among other things. This comes over three months after Peters and Stabenow first pitched a bigger Flint aid package that would have required the federal government to provide $600 million and the state to provide $400 million to Flint. Republicans opposed the legislation and the $220 million agreement resulted from weeks of negotiations. Sen. Mike Lee, R-Utah, delayed consideration of the $220 million package in March by blocking it when Democrats tried to attach it to an energy bill. In a statement on March 4, Lee said, "Federal aid is not needed at this time...What's really happening here is that Washington politicians are using the crisis in Flint as an excuse to funnel taxpayer money to their own home states." "It's completely off-base with a lack of understanding of what's happening in the city of Flint," Sen. Peters told CBS News by phone on Tuesday when asked to react to Lee's comments. "Resources need to come into the city. The state of Michigan has primary responsibility and money needs to come from the state, but it's still inadequate for the needs." Peters expressed confidence that the Senate has the 60 votes necessary to advance the bill. Asked if Sen. Majority Leader Mitch McConnell, R-Kentucky, plans to bring it to the floor anytime soon, his spokesman told CBS there have been no scheduling announcements yet. Congress is on recess until next week. Meanwhile, federal and state officials had estimated that the rescaling of water pipes in Flint, which would prevent lead from leaching further into the water, would be completed by May 1. That was Sunday. Asked for a status update, Melanie Brown, a spokeswoman for the Department of Environmental Quality, told CBS News that recent data "demonstrates that while the presence of soluble lead has decreased, there continues to be lead particles within the water distribution system, causing random spikes of high levels of lead in residential testing." Peters said he appreciated Mr. Obama's decision to visit Flint on Wednesday, but he feared the national attention would soon fade. "It has always been my concern that when the spotlight dims or disappears, Flint will be left with some significant challenges," said Peters, who recounted his meeting a mother who lives in Flint. "A woman I met was basically in tears because of the fact that she was afraid of what this water was doing to her children. The thing that's probably the scariest about it is the unknown. She wasn't sure what kind of impact this would have on her children." Kildee agreed he hopes the president's trip underscores that Flint is still going through a crisis. He said he met this week with a family with children whose lives have also been disrupted. "This one child told me about having to go to grandma's house many miles away, a few times a week, to take a shower. I mean, for a week or two, I understand people have to deal with that. But that's not a way of life that can be sustained," he said. "It's happening to thousands and thousands of people in Flint."